The Giuseppe Verdi Monument is a sculpture in honor of composer Giuseppe Verdi located in Verdi Square Park (between West 72nd and West 73rd streets, between Amsterdam Avenue and Broadway) in Manhattan, New York City. The statue, by Pasquale Civiletti (1858–1952),  depicts Verdi flanked by four of his most popular characters: Falstaff (on the west side of the statue of Verdi), Leonora of La forza del destino (south side), Aida (north side), and Otello (east side). 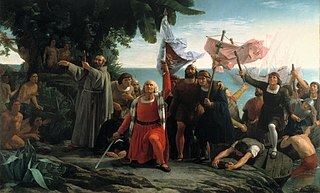 Columbus Day is a national holiday in many countries of the Americas and elsewhere which officially celebrates the anniversary of Christopher Columbus's arrival in the Americas on October 12, 1492. Christopher Columbus was an Italian explorer who set sail across the Atlantic Ocean in search of a faster route to the The Far East only to land at the New World. His first voyage to the New World on the Spanish ships the Santa María, Niña, and La Pinta took approximately three months. Columbus and his crew's arrival to the New World initiated the Columbian Exchange which introduced the transfer of plants, animals, culture, human populations, and technology between the new world and the old. Carlo Barsotti was an Italian-American newspaper and bank owner. He was born in Pisa, Italy in 1850 and died in New Jersey, United States in 1927. Il Progresso Italo-Americano was an Italian-language daily newspaper in the United States, published in New York City from 1880 to 1988, when it was shut down due to a union dispute. In 1989, most journalists of "Il Progresso" reunited to create a new daily, America Oggi. In the early 20th century "Il Progresso" was the most popular of New York's Italian newspapers, selling anywhere from 90,000 to 100,000 copies every day. A permanent maintenance endowment for the monument has been established by Bertolli USA. The monument is listed on the National Register of Historic Places. The collection of outdoor sculpture in New York City is said to be the "greatest outdoor public art museum" in the United States of America. With works from such great sculptors as Augustus Saint-Gaudens, Daniel Chester French, and John Quincy Adams Ward, over 300 sculptures are found on the streets and in parks across the New York metropolitan area. Some of the best known outdoor sculptures in New York City are presented below. Columbus Circle is a traffic circle and heavily trafficked intersection in the New York City borough of Manhattan, located at the intersection of Eighth Avenue, Broadway, Central Park South, and Central Park West, at the southwest corner of Central Park. 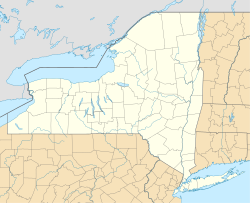 The circle is the point from which official highway distances from New York City are measured, as well as the center of the 25 miles (40 km) restricted-travel area for C-2 visa holders. Tower Grove Park is a municipal park in the city of St. Louis, Missouri. Most of its land was donated to the city by Henry Shaw in 1868. It is on 289 acres (1.17 km²) adjacent to the Missouri Botanical Garden, another of Shaw's legacies. It extends 1.6 miles from west to east, between Kingshighway Boulevard and Grand Boulevard. It is bordered on the north by Magnolia Avenue and on the south by Arsenal Street. St. Paul's Chapel, nicknamed "The Little Chapel That Stood", is an Episcopal chapel located at 209 Broadway, between Fulton Street and Vesey Street, in Lower Manhattan, New York City. Built in 1766, it is the oldest surviving church building in Manhattan, and one of the nation's finest examples of Late Georgian church architecture. It is a New York City Landmark and a National Historic Landmark. Dante Park is a public park in Manhattan, New York City, located in the Upper West Side neighborhood in front of Lincoln Center near Central Park. Marconi Plaza is an urban park square located in South Philadelphia, Philadelphia, Pennsylvania. The Plaza was named to recognize the 20th Century cultural identity in Philadelphia of the surrounding Italian-American enclave neighborhood and became the designation location of the annual Columbus Day Parade. 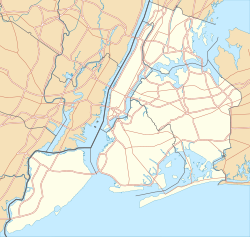 66th Street is a crosstown street in the New York City borough of Manhattan with portions on the Upper East Side and Upper West Side connected across Central Park via the 66th Street Transverse. 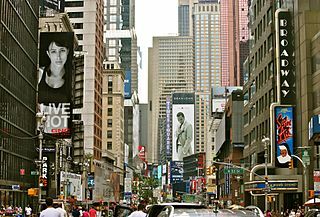 West 66th Street is the location of the historical Lincoln Square and the modern Lincoln Center for the Performing Arts at Broadway and Columbus Avenue, as well as the name of the subway station on the IRT Broadway–Seventh Avenue Line which serves the cultural establishment. Duffy Square is the northern triangle of Times Square in Manhattan, New York City. 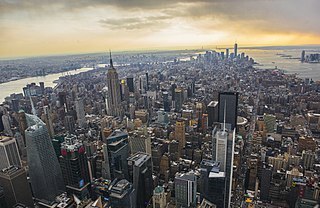 It is located between 46th and 47th Streets, Broadway and Seventh Avenue and is well known for the TKTS reduced-price theater tickets booth located there. The James Cardinal Gibbons Memorial Statue is a public artwork by Leo Lentelli, located at the Shrine of the Sacred Heart, 16th Street and Park Road Northwest, Washington, D.C..
Giuseppe Garibaldi is an outdoor bronze sculpture of Giuseppe Garibaldi, one of the leaders of Italian unification, in Washington Square Park in Manhattan, New York. The statue and its granite pedestal were created by Giovanni Turini upon the organization of the editors of the newspaper Il Progresso Italo-Americano to raise funds to commemorate Garibaldi after his death. Turini was a volunteer member of Garibaldi's Fourth Regiment in the campaign against Austria in 1866. The statue was dedicated on June 4, 1888. Washington Park is a city square in Downtown Newark, New Jersey. It is the northernmost of the three downtown parks, along with Lincoln Park and Military Park, that were laid out in the colonial era. The triangular park is bounded by Broad Street, Washington Street, and Washington Place at the end of Halsey Street. It is home to several public statues and is surrounded by historical, civic, and commercial buildings, including those of Rutgers-Newark. ↑ National Park Service (2009-03-13). "National Register Information System". National Register of Historic Places . National Park Service. 1 2 "Verdi Monument – Historical Sign". City of New York, Parks & Recreation. Retrieved 2013-10-16.